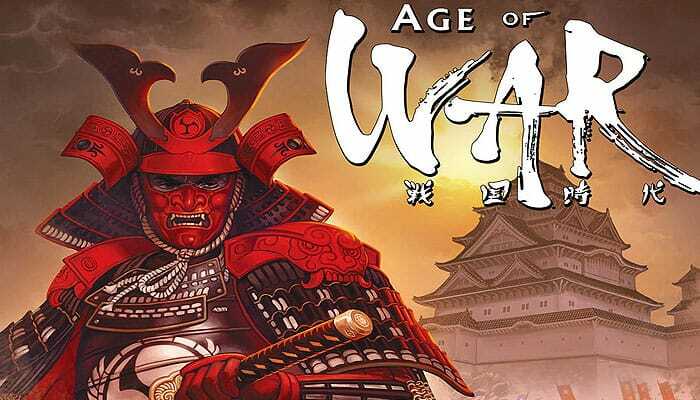 Age of War is played over several turns starting with the first player and going clockwise. On a player's turn, he rolls dice to musters his troops, and he uses varying troop types (infantry, archery, cavalry, and daimyos) to try to conquer a castle. The game ends when a player conquers the last castle in the center of the table. During each turn, a player tries to conquer a castle by filling all battle lines on the card. The player begins his turn by rolling all seven dice. Then he decides to either start conquering a castle or to reroll his dice. To reroll his dice, he must lose a die by setting it aside for the rest of the turn. To start conquering a castle, the player selects a faceup castle card and fills any one of its battle lines. 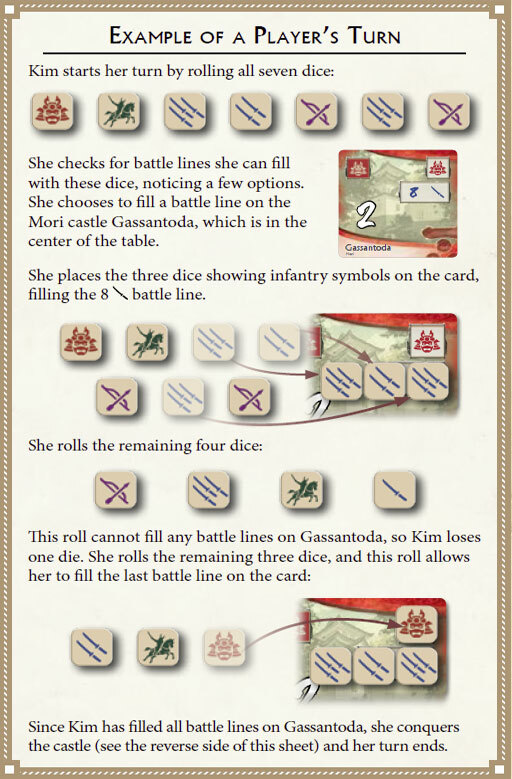 To fill a battle line, the player must place dice on the battle line that match all the symbols of the line. Then the player rolls his remaining dice. After each roll, the player must either fill another battle line on the selected castle or lose a die and reroll his remaining dice. This continues until the player either successfully conquers the castle by filling all battle lines or loses his last die. This concludes the player's turn and play moves to the player on his left. If the symbols on one or more rolled dice match all the symbols of a battle line, the player may fill the battle line. To do so, he places those matching dice on the card, covering up that battle line. Dice used to fill a battle line are not rolled by the player for the remainder of his turn. A player can fill only one battle line per roll, and he is not required to fill battle lines in any specific order. A player can fill a battle line on any faceup castle card in the center of the table or in front of an opponent. Important: Once a player fills his first battle line for the turn, he cannot fill battle lines on other cards during that turn. All battle lines that he fills must be on the same castle card. There may be rare situations in which a player does not want to fill a battle line. For this reason, a player can always choose to lose one die instead of filling a battle line. Battle lines with a number and a \ symbol are infantry battle lines. An infantry battle line is filled with one or more dice showing any \ symbols (\,\\, and \\\). To fill an infantry battle line, the total number of \ symbols must be greater than or equal to the number shown on that battle line. To conquer a castle in the center of the table, a player is not required to fill the special daimyo battle line. However, to conquer a castle in front of an opponent, a player must fill the special daimyo battle line. When a player fills all battle lines on a castle card, he has conquered the castle. He places that card faceup in front of him. 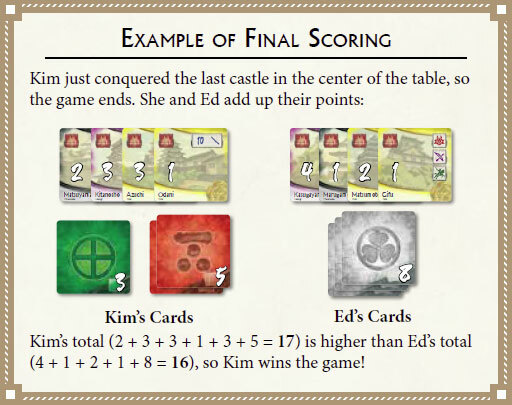 At the end of the game, each player scores the points shown on each faceup castle card in front of him. 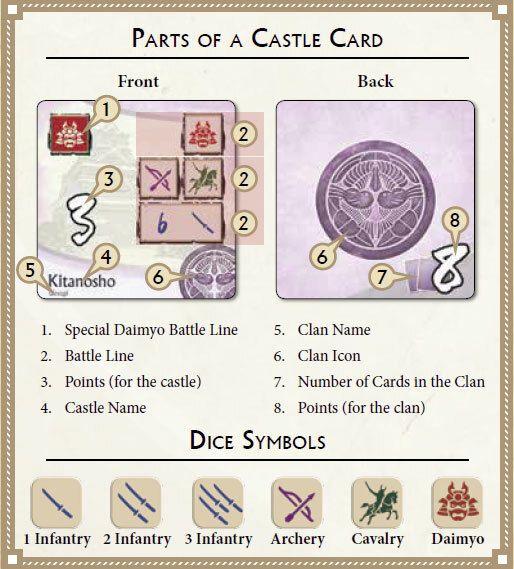 Castle cards belong to various clans, as indicated by the color and clan icon shown on the card. When a player has conquered all the castles that belong to a clan, he has conquered that clan; he flips those cards facedown and arranges them in a pile with the card showing points on top of the pile. At the end of the game, the player scores the points shown on the back of this top card instead of the points on the front of these cards. Important: Facedown castle cards cannot be conquered by other players. When a player conquers the last castle from the center of the table, the game immediately ends. 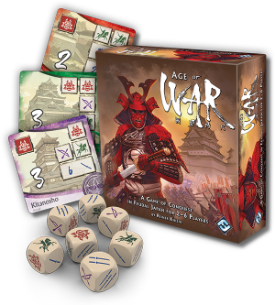 Each player adds up all the points in front of him, which includes each faceup castle card and the topmost card of any conquered clan piles he has. The player with the most points wins the game. In case of a tie, the tied player with the most conquered castles wins the game. If there is still a tie, the tied player with the most conquered clans wins the game. If there is still a tie, then the tied players share the victory.